The original sash windows were, of course, single glazed. As part of our aim to produce a very traditional sash window, we can glaze the sash window with Slenderpane™ slim glass units that are almost imperceptible as double glazing but still offer excellent thermal insulation and sound reduction benefits. These slim glass units are now very commonly approved for use by conservation officers and increasingly for use in windows of Grade 2 listed properties. Our attention to detail throughout our dealings with you, together with no pressure, helpful and friendly initial advice, has been a ‘win win’ formula for both our company and our customers. All our windows are made in Britain at our Buckinghamshire workshop. 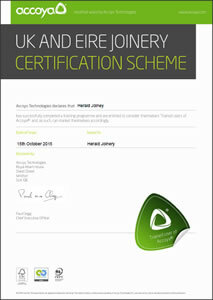 CE Marking – Herald Joinery are CE marked. Please note that a new EU directive was introduced on 1st July 2013 that makes it a legal requirement for all external windows and doors to carry a CE Mark. The supplier is required to sign a DoP (Declaration of Performance) to state that the U value of the window or door is certified as shown on the label and assert that any safety devices are fit for purpose. It is important therefore that in comparing quotations with other suppliers, you check that they CE mark their product.